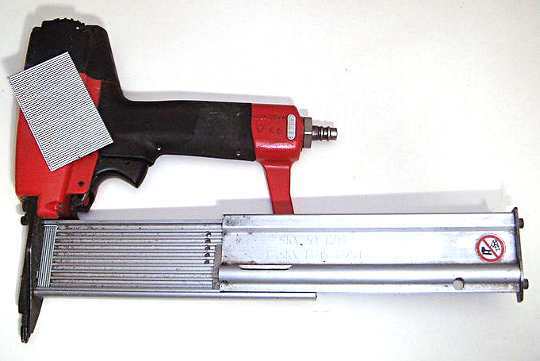 A pneumatic nail gun suitable for small finishing nails. A pneumatic nail gun specifically for laying secret nailed wooden flooring. A pneumatic staple machine much like a small nailgun. An Air operated nailer with a few nails sat on top. This is type of nail gun is a "must Have" tool for any carpenter or joiner who regularly does trim carpentry or second fix work as it is known in the UK and Australia. The main advantage of a nail gun is of course speed, it is a lot daster than nailing by hand. It is a one hand operation, so it is possible to hold the work in one hand and get a couple of nails in with the nailer to fix it. After a preliminary set-up there are no more bent nails. These machines have the ability to set the nailer to just drive the nail head just below the surface, so that there is no need for punching the heads for the painter. There is quite a good range of nails availabe and the heads are designed for the job of finish nailing. That is they may have "T" shaped heads, so that they grip the timber well, while at the same time not leaving too much of a footprint for the later trades to cover up. 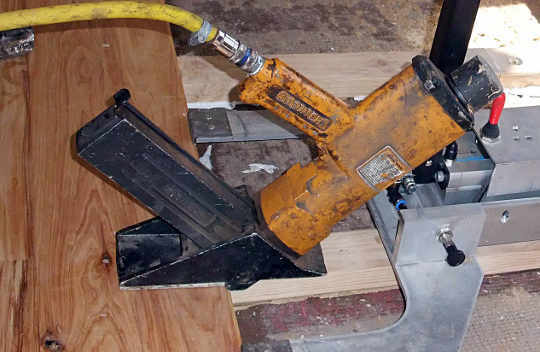 A Bostich nailer modified for the specific job of secret nailing flooring. The photo above is another instance of how nailguns are making the finsh carpenter's work more easy. The hardest part of secret nailing floors has been removed by the introduction of the nailers. 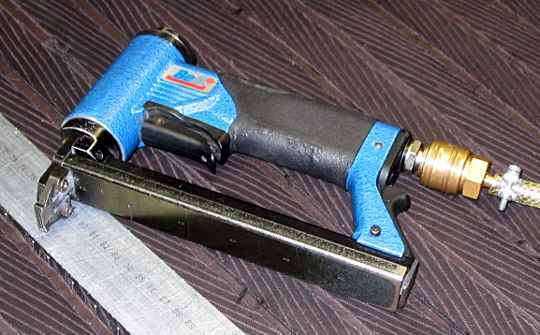 Much used in cabinet shops these staple guns are fast to use and the staples achieve more grip than you would expect. Once again the heads can be set to finish just under the surface. Don't confuse these tools with office staple machines. These can drive large staples up to 1-1/2" or 30mm depending on the make and model.